Let your loved ones cherish the moment that this gift of Pretty Morning Sunshine 15 Yellow Roses Bouquet creates with the essence of your love for them. 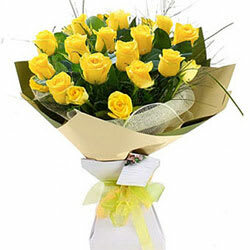 Let your loved ones cherish the moment that this gift of Pretty Morning Sunshine 20 Yellow Roses Bouquet creates with the essence of your love for them. Let your loved ones cherish the moment that this gift of Pretty Morning Sunshine 24 Yellow Roses Bouquet creates with the essence of your love for them.